The slender shapes and the transmission characteristics of the Neumann KM 185 make the "Series 180" especially suitable for a very wide range of tasks in the radio and television sector. The KM 185 hypercardiod can trace its roots back to the enormously successful KM 184, a microphone successful in becoming a market standard in essentially no time at all. The pressure gradient transducers KM 185 include very smooth frequency responses not only for the 0° axis, but also for lateral (off-axis) sound incidence. In the diffuse sound field it enjoys a flat frequency response and, during standard usage, there is no colouration of sound over a wide pickup angle. The KM 185 with its hypercardioid characteristic features attenuation of sound incidence from the side or rear of about 10 dB, with minimum sensitivity at an angle of 120°. 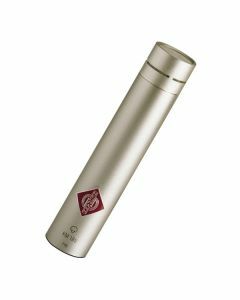 Neumann’s "Series 180" contains three neatly miniaturised microphones with patterns to fulfil the criteria set by any studio. Thanks to its enhanced mechanical build and deliberate omission of modularity, the "Series 180" is designed for cost-efficient production and home recording studios. All the mics in the series are finished with either matte black or nickel. As is the case in the KM 100 system, the "Series 180" microphones have the same transformerless circuitry. The end product is beyond superb technical specifications and each microphone functions seamlessly, even if the input of following equipment happens to be unbalanced, for example, as in some DAT recorders. The output of the "Series 180", as in all Neumann microphones, is balanced and phantom (48V) powered.